There is less than 24 hours to pre-order a Glowforge 3D laser printer at the 50% discount price. Total pre-orders are over $20 million as last minute buyers decide to pull the trigger. With the clock ticking, it is time for a quick and dirty analysis of the situation from a totally unqualified source (random HS teacher with a blog). I don’t think Glowforge wants to be a cheap laser cutter manufacturer, I think Glowforge plans to become a billion dollar company. Watching the team at MakerCon and Maker Faire NY was like watching a documentary on the founding of Facebook or Apple. This is a team that intends to ‘disrupt markets’. I think this initial pre-order is just one step in a carefully orchestrated plan to blow the value of this company sky high. Before I put down my own money for a $2,000 machine I want to consider where Glowforge is going. 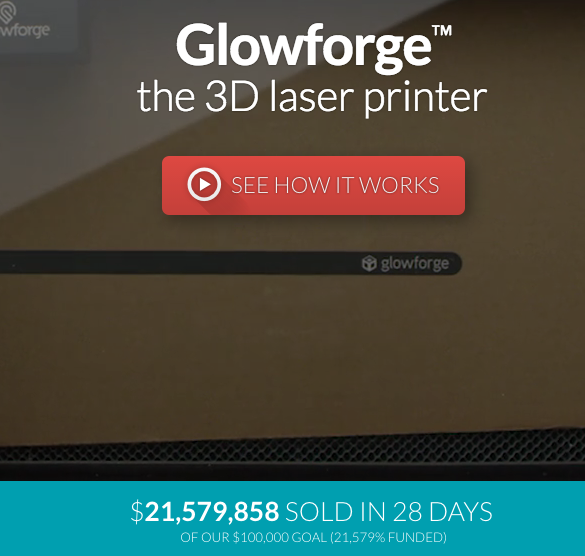 So, how does a brand new 3D Laser Printer company scale to a billion dollars? They don’t do it by being a cheap laser cutter brand. There are too many sources for cheap 40W lasers that can do most of the same stuff at lower cost than even the current discount price. (You can also expect knock-offs to start rolling out any day.) Full Spectrum Laser has a model with similar bed size that at $3,500 is lower than the $4,000 msrp on the Glowforge. Right now Glowforge has pre-orders for between 5,000 to 10,000 units. Using the Full Spectrum Laser price as a guide we can guess that Glowforge is essentially making the pre-orders at cost with the potential to lose plenty if they have any manufacturing, shipping or design problems along the way. Offering a discount for a day or two to prime the pump and gain market share makes sense but the extended offer seems like they are gambling with their cash when they need it most. Glowforge did have a Series A investment of 9 million dollars which helps but again that points squarely to not wanting to become a cheap laser cutter brand. I estimate that the first month of pre-orders will take at least a quarter to deliver all units from the first shipping date. April would be an incredibly optimistic shipping date for anyone ordering right now. A billion dollars in sales would require 125,000 – 250,000 units shipped which might be possible over a 4 to 6 year time period if demand were constant. (Similar projections would have been reasonable at certain points in the last few year for Stratasys/Makerbot.) For some reason, having lots of hardware in the hands of customers beats out having cash on hand to invest in scaling up production. How does cloud only software diversify Glowforge’s revenue stream? I think there is much more at play than hardware sales and it has to do with the cloud only software that makers are complaining about. The built in cameras and the cloud only software give Glowforge the option of having multiple ongoing revenue streams. The simplest way is to charge a subscription fee for advanced features. The more the software can automate the design process the more valuable having access to ‘Pro’ features becomes (remember this is pure speculation). Automatic recognition of the latest laptops and cell phones for engraving would be worth an ongoing subscription fee. Add some material profiles and cutting optimization routines along with a series of cool software features and each 3D laser printer sold become an ongoing cash stream. $10-$50 a month fees could add up to millions in annual revenue after only a few quarters. The current set of software features will remain free to current purchasers but I expect there would be a lot more to tempt users to subscribe. Design choices on the hardware side to reduce costs will also make it harder for 3rd party software to fill the void for customers trying to avoid using the Glowforge cloud software. How can Glowforge make money each time their product is used? Hardware and software subscriptions can only scale revenue so high. The way to have explosive growth is to figure out a way to make money each time a design is cut. Like a Keurig coffee maker, Glowforge can profit each time the machine is used. Having a store with high quality designs available turns Glowforge from a hardware to a content company. The camera system and cloud only software means that designs sit on their server and not locally. Glowforge can offer high end designers security that users have paid for each design cut. Users can be charged for each use of a design with the camera systems verifying the the design was cut successfully. The ‘market disruption’ is the local manufacturing of high end goods. This sort of plan doesn’t require a Glowforge in every home but offers up a world of possibilities for small businesses. Imagine the potential for bakeries to be able to cut wedding cake designs from the latest issue of Bride magazine. Imagine if Makerbot made money every time someone downloaded and printed a design from Thingiverse. Not everyone will pay to cut designs but the app economy shows there is plenty to be made if even a small number of users are willing to pony up a $1 or more per use. How do you get lots of people to pay for designs? Licensing is a great way to get users to pay for designs. Imagine a deal with Disney (Star Wars & Princesses!) or the NFL to sell licensed designs for engraving on cell phones and laptops. The camera system and cloud software ensure every use of a design is paid AND can also prevent piracy and unauthorized use of designs or logos. A singe use of a design for personal use is one thing but users could be flagged if they are making multiple copies of unlicensed designs for commercial use. I’m not sure what these sorts of licensed designs would go for but $20-$40 to etch a Force Awakens logo on a laptop doesn’t sound unreasonable with Glowforge making 30% on each sale. Any other sources of revenue? Material packs are also a potential revenue generator with Glowforge branded materials available at the local craft store and cloud software profiles for each product. Premium kits that are paired with design also make sense. Buy a wallet or phone case kit and then choose from a set of professional or licensed designs on the design store. Between hardware – software subscriptions – design store – licensed designs – materials Glowforge could have a great digital fabrication ecosystem and rocket them to a billion dollar company. Of course the golden ticket would be a sale to a large company. I think Glowforge is preparing themselves early with assurances that they will open source their firmware and allow makers to own their machine even if the company folds. Sure this promise helps reassure maker who are considering pre-ordering and afraid they will be a left with a brick if things don’t work out. I think this is also an out to avoid a class action law suit in case the company gets bought out and the new owners decide not to keep the servers running. Bottom line, I think makers buying a Glowforge right now should see it as a what you see is what you get purchase in terms of hardware and software capabilities. It is easy to fill in the gaps and imagine all sorts of future possibilities. In the long run, makers, hackers and tinkerers buying a Glowforge now will be disappointed if some of these prediction about paths for revenue growth come to pass. For consumers, Glowforge may be the company that can bring digital fabrication from the news feed into their homes or at least to the local mall. P.S. Strongly trying to stop myself from pre-ordering as I have access to laser cutter at school and my local makerspace. I did ping my local makerspace and offered to chip in for a Glowforge purchase for the group. Have your own predictions about where Glowforge is headed or digital fabrication in general? Leave a comment or contact me on Twitter @DesignMakeTeach.